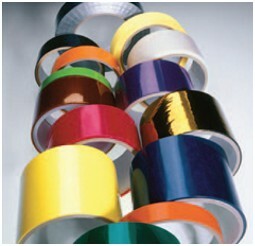 636 Silver, polyethylene duct tape with an aggressive rubber-based adhesive; available in black, white, yellow, sky blue, teal blue, dark blue, red, burgundy, purple, racing orange, tan, brown, light and dark green 10.2 39 oz. Rubber Bundling, heavy carton sealing, general maintenance, pipe wrapping, duct seam and joint sealing, maintenance, pipe wrapping, duct seam and joint sealing. 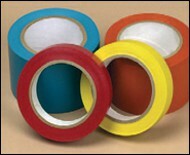 JR205 Clear, polyethylene tape with a medium tack acrylic-based adhesive 5.5 56 oz. Acrylic Patching and repairing film on greenhouses, boating and RV, water color stencil, surface protection and electroplate masking. 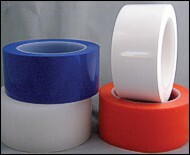 JR209 Clear, polyethylene tape with a medium tack acrylic-based adhesive with a white poly coated release liner 6 36 oz. Acrylic Patching and repairing film on greenhouses, boating and RV, water color stencil, surface protection and electroplate masking. JH1401 Silver, matte finish polyethylene gaffers tape with a rubber-based adhesive; available in black, red, white, grey, yellow and olive drab 11.8 29 oz. Rubber Holds down cables, wires, electrical cords and in step-set-ups for marking placement. Use as a book binding tape for seaming.